Have you ever had a conversation with someone who just wouldn’t stop talking? I’m talking about the kind of conversation where you worry for the other persons safety; there couldn’t possibly be oxygen going to their brain for minutes on end. Just a stream of endless words pouring into space and flooding your ears. It probably felt kind of exhausting, right? On the other side of the spectrum, have you ever had a conversation with someone who had difficulty getting their point across? They stuttered, paused, started one thought, but continued into another. At moments you may have felt as if you were stuck inside the screen of a lagging computer, with no hopes of escape lest you perform a manual shutdown. Both of these conversational situations can be equally frustrating for different reasons, and perhaps you may admit you’ve been an offender. 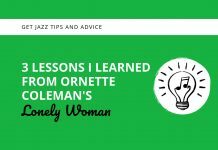 On this blog we often stress that music (and in this particular case, jazz) is a language. It’s not like a language, it is a language. And even if you know the right words to say (playing the right notes) and have a grasp of the accent, it doesn’t mean you are ready to communicate effectively. So what is phrasing? Well, it’s essentially both the definition of a phrase and how to play a phrase. For our purposes and in this context, phrasing is simply: a complete musical idea and how you execute it. In other words, you take a breath and you express a complete thought that provides context and meaning to your musical conversation. We could go more in depth into what makes good phrasing (rhythm, harmonic context) but that’s for another time. Charlie Parker is good. He has a saxophone. He plays it well. I want to be like him. He pioneered bebop. Charlie Parker is a really smart guy. Charlie Parker is a great saxophone player and I also think that pizza is one of the best inventions in culinary history. Seriously I love the cheese, the sauce, the crust, and penguins are birds that can’t fly. This one probably sounds funny to you and it should! What we have here is a series of connected ideas that aren’t related to each other, nor do they build off of each other. The two sentences go from Charlie Parker, to pizza, and then to penguins. There is no logical connection between them. This phrase might sound ridiculous to you, but I’ve also heard a lot of soloists connect ideas together that made absolutely no sense. Sometimes this is because they are regurgitating licks they have learned and trying to force them to work together. Other times it can just be a scramble to try to “play the right note” rather than creating a melody. Charlie Parker was an iconic saxophonist who came to the forefront when he lead the pioneering of bebop which was a departure from the danceable style of jazz playing in the swing era and bebop turned jazz into more of a virtuoso music that focused on the talent and ability of the musicians which has in many ways still remained a staple part of modern jazz today. As we have already concluded from the previous phrase, an endless stream of words and run-on sentences makes for a bad phrase. So what is it that we need to break it up? Space. Sometimes not playing is the best way to drive home the idea you are trying to express. Space can make the phrases you do play, all that more powerful! The key is to listen to the other players you are making music with. Try playing a phrase and then listening to what the band is playing behind you for a second. So what if you miss that ii-V-I or you start your solo two bars late! Don’t play something just for the sake of playing, play because you actually want to play it. Try an exercise where you play a two bar phrase over a jazz standard and then rest for the next two. 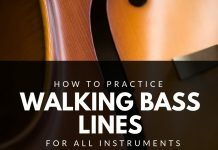 It may not be how you actually play in a live playing situation, but it will help you practice combining phrasing and space. Let’s take a look and a listen to how Charlie Parker approaches phrasing and space in his solo on Blues For Alice. Notice how each idea builds off of the next, and each is separated by space. Charlie Parker sounds exactly as if he is speaking in full sentences because in fact he is! 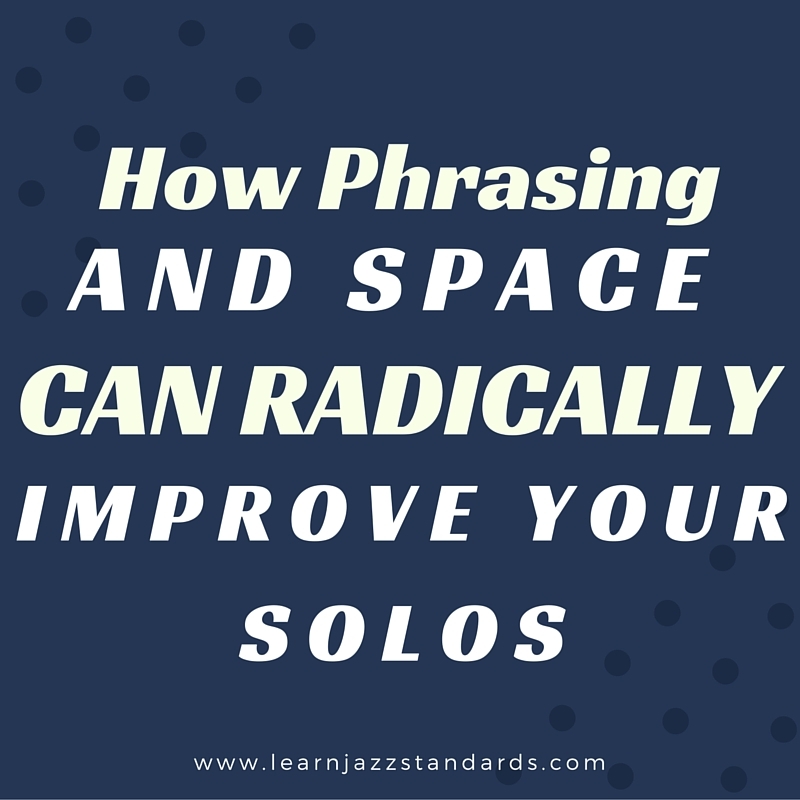 So the next time you go to take a solo, think about your phrasing and your space. Consider these just as important as playing the “right notes” and your solos will be much better for it. 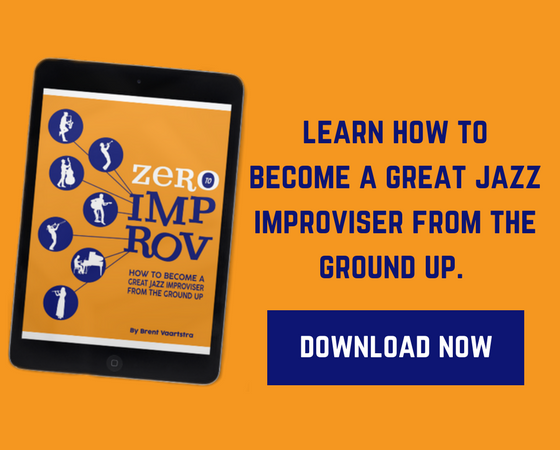 Taking space, not playing or playing only a few notes at certain times, is a special problem of many conservatory educated jazz improvisors. They want to show off how good they control their chords and scales and play 500 notes per minute as if they are followed by the CIA (Central Improvisors Agency)! 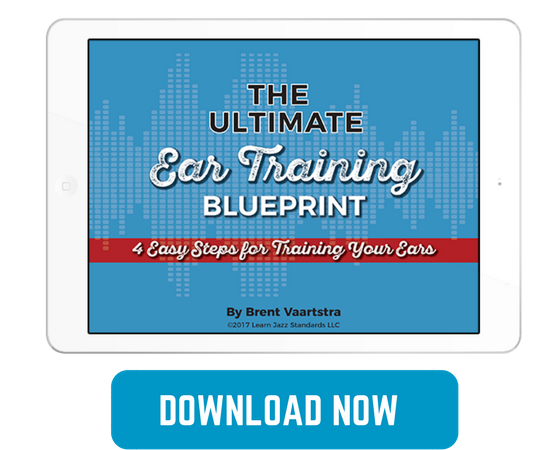 Most of the time the listener loses control over the central tune, because you listen to a slush of notes in which nothing can be recognized anymore. With as a result you give up listening!